Step 1: Print and cut out the template for both bunny ears. Draw hot water bottle on paper with pencil and add approx. 2 cm seam allowance all round, create small facing for top opening. Step 2: Cut the sleeve 2 times from main fabric, and place right sides together and stitch together with an overlock stitch leaving the top open. Step 3: Cut the two small ears 2 times from Vliesofix (1 cm seam allowance at the bottom), iron on the wrong side of the fabric of the black fabric and cut out. Step 4: Cut the ears 4 times from white fabric (with around 1 cm seam allowance). 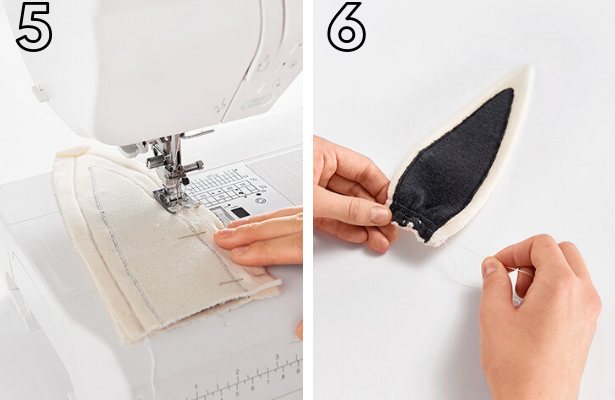 On each of the ears iron on the small black ear and sew on all around with a narrow zigzag stitch. Step 5: Then put the two ears (with black inner ear) right sides together on the big white ear and stitch at 1 cm. Cut seam allowance back to 2 mm. Step 6: Turn both ears right side out and iron. Then sew a basting stitch at the bottom of the ears and gather in. Knot thread ends. Step 7: Cut the facing out (1 cm seam allowance). 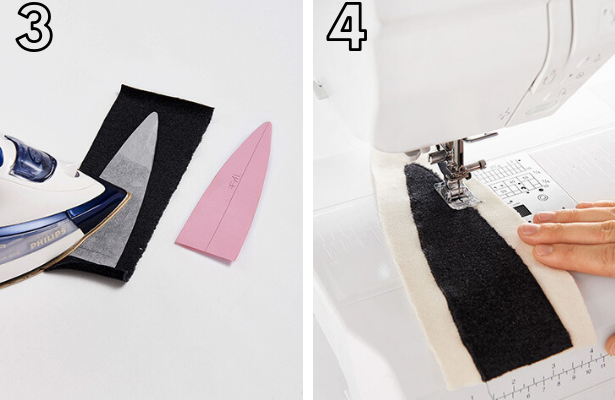 Stitch the lower edge with the overlock, then fold right sides together and close the side seam with an overlock stitch. Step 8: Pin the ears to the opening, then attach the facing right sides together and stitch around at 1 cm. Turn the facing inwards and topstitch around 0.7 cm on the right. 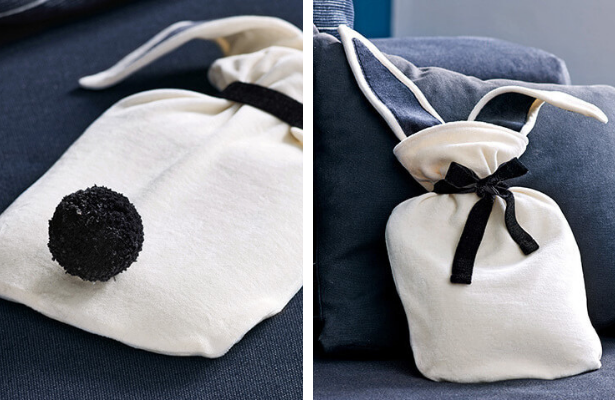 Using the pom-pom maker and wool yarn, make a little bunny tail and hand stitch to the lower back of the cover. 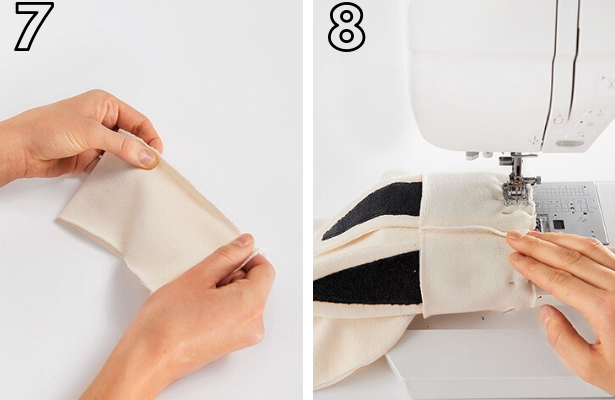 Insert hot water bottle into the slip and tie “neck” of bottle with a finishing ribbon. 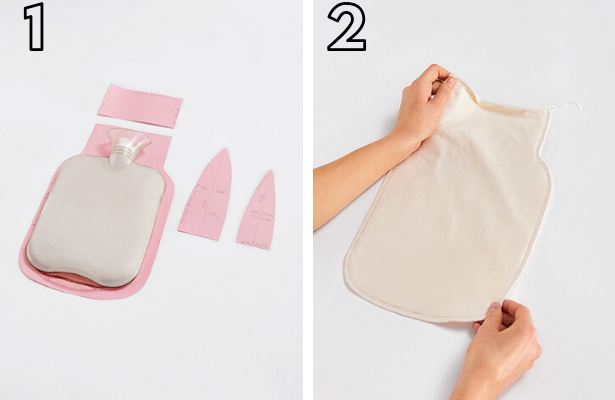 High cute factor for making a hot water bottle more snuggly! Might make a great gift add-on if buying a hot water bottle as part of a housewarming or shower gift for someone. Thanks for the pattern!